Yesterday for whatever reason there was little or no internet. It wasn’t just local service, friends of mine all over the country and in other countries reported the same thing. 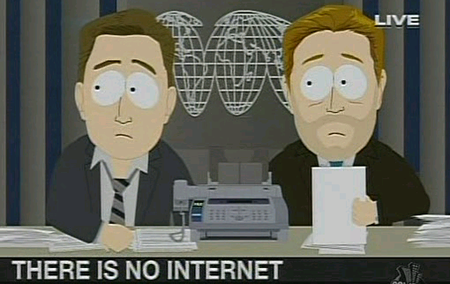 Calling Verizon Fios my provider didn’t help they just told me there was an “issue”. The incident seemed to go unobserved by the media. Now this made me curious. Could it be a hacker that got into the web and messed with all the works and they don’t want us to know? Is the web so used now that it is overloaded? Seems coincidental that Ramadan, Fourth of July and other holidays are coming up. It also made me think. What if one day we all woke up and there was no more internet? How would we cope? Because of social media and the internet I have friends all over the world. Except for snail mail and who knows if that would work either as everything is computerized now I would have no way of contacting them. Even though some I have never physically met I feel very close to a lot of them. I wonder why. Could it be without the physicality we can truly know another person or is it that we project what we wish we could be and that is who others friend? 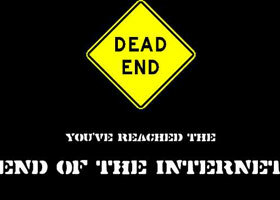 Without the internet, a lot of our lives would change drastically. For a medium that really has only gone mainstream in the past thirty or so years, it has changed all of our lives. Our blogs are a way of connecting and expressing ourselves. What if tomorrow they were gone? Would we then write stories again with pen and paper? How many of you would continue to write even though you aren’t getting the instant gratification of seeing others read your work? Are we writers because of blogs and for no other reason? All of this really made me stop and think. If we have enemies that want to take civilization down. They don’t need bombs to do it. Only a keyboard. That my friend is frightening. blogging and internet civilization communication Fourth of July internet internet hackers no internet? Ramadan why do we blog? Oh dear, now your all alone. When anything gets too big it implodes – Unfortunately its the pits, but the I-net has to be big to serve. That really does make you think. For instance – how would all the internet trolls cope? Would they randomly walk the streets, knocking on people’s doors and offer them abuse? Probably not as they wouldn’t be brave enough. Maybe teenagers would have to print out selfies and hand them round at school or something. The Kardashians would literally wither and die. I started off writing with pen and paper and no doubt I would return to that medium if the internet didn’t exist. I would just have to pin my missives to trees and lamposts, I suppose. Thanks for the reblog don’t know what I would do without some of these very special people in my life. It is very scary my wonderful friend, but i would find you somehow. Even if i had to move to nearer to where you live. Internet or not my friends dont get rid of me that easily, not my true friends. I love you guys.